Former professional Euan McIntosh (Turnhouse) leads the field by one stroke at the halfway stage of the 72-hole Order of Merit event, the Leven Amateur Champion Gold Medal at the Fife links. 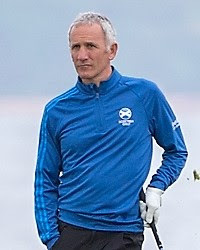 The 48-year-old, who returned to Scotland from Germany in April last year and achieved six top-five finishes to win the Scottish Golf Order of Merit and an international cap, shot a pair of four-under-par 67s for eight-under-par 134 and a narrow advantage over first-round leader Steven Stewart (Clydebank and District) (66-69) and James Wilson (Balmore) (71-64). McIntosh has had only one bogey over the first 36 holes - at the short 15th in his first round. He birdied the second, 12th, 13th and 16th in his flawless second circuit. Wilson's second-round 64 was the lowest score of the first day and he did it with halves of 29 and 30, birdieing the second, third, seventh, eighth, ninth, 12th and 16th. Stewart could not quite achieve his first-round standard with a 69 which had two bogeys to offset four birdies. Jonathan Keith, who made the long trip down to Fife from Inverness, had the second-best Saturday score - a 65 and he will start the third round in fifth place on his own on 137. Keith had three birdie 2s and an eagle 3 at the 13th in halves of 33-32. The precise number of 40 players - no ties - with 36-hole totals of 148 and better qualified for Sunday's third and fourth rounds. Thomas Kerr (Shrewsbury) had a hole in one at the 15th in his second round of 70. He is tied sixth at the halfway stage. The Leven Gold Medal, or to give it its "proper" title, the Amateur Champion Gold Medal, is the oldest amateur stroke-play tournament in the world of golf. 134 Euan McIntosh (Turnhouse) 67 67. 135 J Wilson (Balmore) 71 64, S Stewart (Clydebank and Dist) 66 69. 136 J Johnston (Ayr Belleisle) 70 66. 137 J Keith (Inverness) 72 65. 138 G Munro (Newmachar) 71 67, B Soutar (Leven GS) 69 69, C Low (Tantallon) 72 66, T Kerr (Shrewsbury) 68 70. 139 J White (Lundin) 70 69, M Napier (Turnhouse) 69 70, A Carrick (Douglas Park) 67 72, J White (Lundin) 70 69, C Fyfe (Cawder) 72 67. 142 B Henderson (Deeside), G Wishart (Lundin) 70 72, C Mitchell (Lundin) 70 72, S Roger (Cruden Bay) 74 68. 143 M Hislop (Glenbervie) 75 68. 145 C Pirie (Millport) 72 73, S Hedger (West Kilbride) 69 76, J Stephen (Aberdour) 72 73, A Collier (Duke's) 70 75, M Boddie (Dunbar) 74 71. 148 N Peoples (Royal Lytham) 74 74, H Gorn (Aberdour) 72 76, R White (Leven GS) 72 76 V Varadharajan (Royal Burgess) 72 76, A Benson (West Lothian) 70 78, J Tilleczek (Canada) 69 79. 149 C Mundie (Glenbervie) 74 75, A J Sutherland (Cupar) 74 75. 150 B McKay (Crail GS) 76 74, C Gibson (Blairgowrie) 76 74, M Miller (Lundin) 73 77, S A Hill (Leven Th) 72 78.